Gou is joining the opposition Kuomintang primaries, friendly to the Chinese government, Reuters reported. 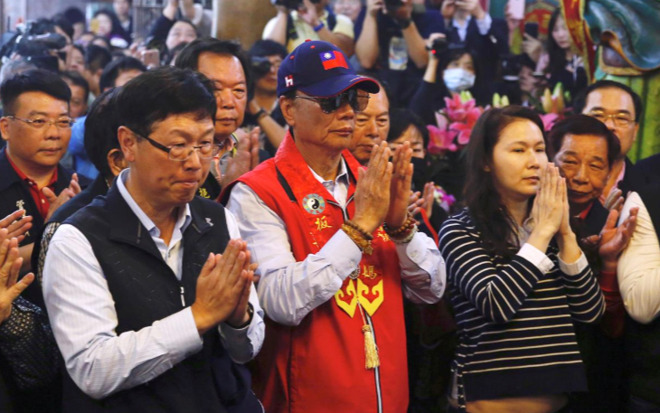 Though Taiwan has effectively been independent for decades, China considers it a renegade province — the island has walked fine line between appeasing Chinese rulers and maintaining its freedom. Foxconn is headquartered in Taiwan but operates primarily out of mainland China. On Monday, Gou announced that he was stepping down from daily operations, nominally "to let young people learn sooner and take over sooner and to replace my position sooner." He later hinted at a presidential bid however, and made the run official at a temple, where he told a crowd that the sea goddess Mazu said he should. Mazu is popular in Taiwan and thought to influence safety and fortune. "Peace, stability, economy, future, are my core values," Gou went on to claim at Kuomintang headquarters. The party still needs to vet his candidacy, and while his net worth is estimated at $7.6 billion, he could still easily be defeated in primary voting. An advisor to Taiwan's current President, Tsai Ing-wen, suggested that Gou is "very pro-China" to the point that it could compromise national security. In fact Chinese bombers and naval vessels conducted drills near the country on Monday, likely as a message to both candidates and established politicians. China has not ruled out invading Taiwan if the island formally declares independence, though that risks a war with the U.S. and other regional powers. Apple is Foxconn's biggest client, for which it assembles iPhones and other core products. A change in leadership at the manufacturer will at least sway business dealings between the pair — if Gou were to win the primaries and then the general election, it could force Apple to take a stronger stance on Taiwanese independence one way or the other. The company has increasingly been accused of bending to China's authoritarian rule rather than risking access to a lucrative market. In the case of Taiwan for example, iPhones, iPads, and Macs sold in China won't display the Taiwanese flag by default —even though Apple is closely dependent on Taiwanese suppliers, another being A-series processor manufacturer TSMC.